Phone Integration with the InfoServ CRM System is easy and requires no special hardware equipment. Phone communication is one of the most commonly used business communication channels. Having your phone communication integrated into your CRM system gives you a competitive advantage and facilitates a better customer service. Yes, that’s all you need to have your phone communication integrated into your InfoServ CRM system! The InfoServ CRM Software suit consists of three applications: InfoServ CRM Client, InfoServ Administrator, and InfoServ CRM Phone Server. The InfoServ CRM Phone Server is the software which controls and manages the phone communication in the InfoServ CRM system. The requirements listed above are a minimum! If you plan the InfoServ CRM system to be used by many users, then you should choose a computer with higher technical specifications in order to provide consistent performance of the system. You should also ensure a reliable and secure internet connection for this computer. In many cases, the companies prefer using SIP2.0 (VoIP) providers mainly because of their accessibility and simplicity of integration with other systems and in general. 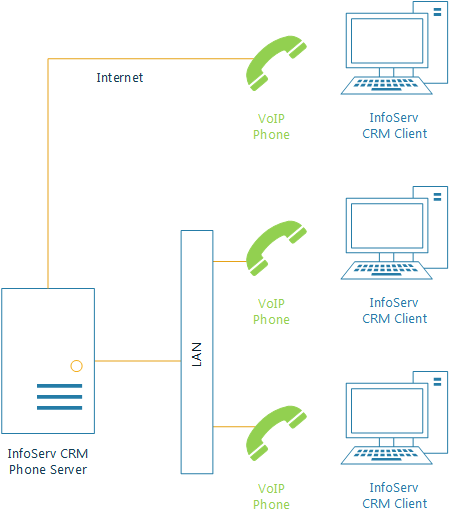 In this case the VoIP provider will connect to the InfoServ CRM Phone Server via SIP 2.0 protocol using the internet connection. Therefore. It is of critical importance to ensure a hi-quality, reliable internet connection to provide the best environment for your phone communication. It is also possible for InfoServ CRM Phone Server to accept telephony from PBXs (Private Branch Exchange). 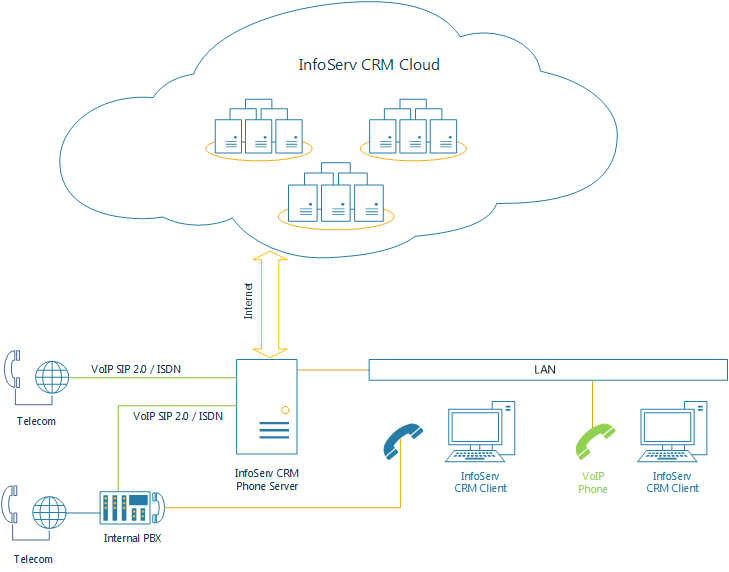 Depending on the type of PBX (SIP 2.0 or ISDN) the integration specifics with the InfoServ CRM system are the same as the ones described above. In case you use a PBX, you may also use the standard phone devices connected to your PBX instead of VoIP 2.0 phones. The standard phone devices are specified as internal numbers for the PBX in that case. 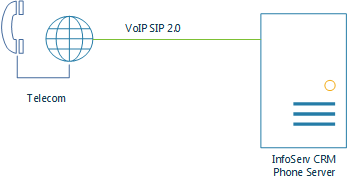 a) via LAN – most commonly VoIP SIP 2.0 Phones are connected through LAN. In this case you have to put your VoIP phones and the InfoServ Phone Server in the same local area network. b) via internet – in rare cases a VoIP 2.0 phone can be connected to the InfoServ Phone Server via internet connection. In summary, Phone Integration with the InfoServ CRM System is easy and requires no special hardware equipment. It uses ISDN or SIP 2.0 protocols to connect to the phone providers and may accept phone communication from a PBX using the above-mentioned protocol. Users accept make and take phone calls using VoIP SIP 2.0 Phones, or in the case of PBX configuration, they may also use standard phone devices connected to the PBX instead. You can review the InfoServ CRM Subscription Plans and pick the one that suits your needs the most at www.infoserv.eu/Store/Pricing.